Hi everyone and Happy Friday! Even though this was a shorter work week, the entire week seemed to drag on for me. I'm so excited for this weekend! 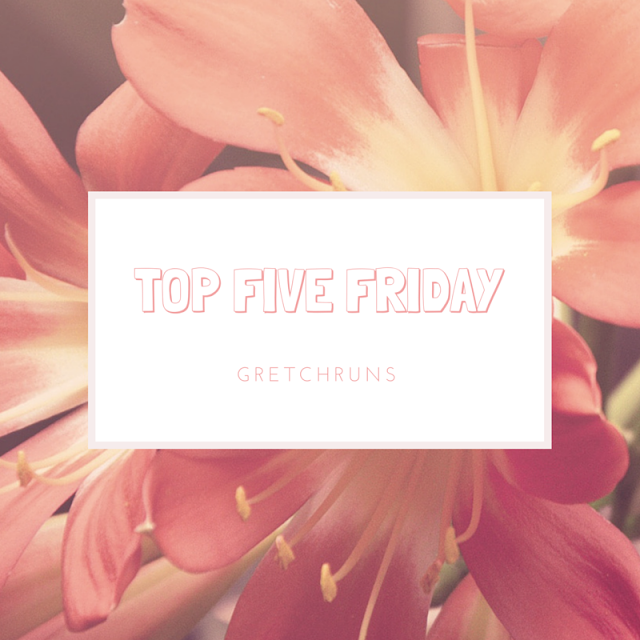 Instead of having a themed "Top Five Friday", I decided to share five things that I'm currently obsessed with. A lot of these are upcoming events in Pittsburgh that I'm excited about. The city is definitely picking up its fitness game lately, and I'm so excited for some of these programs to start. If you're visiting Pittsburgh this summer, make sure to check them out! If you're a resident, I hope to see you around :) I also have an athletic event I've been following very closely, and a podcast I can't stop listening to! Last year, I went to the first Open Streets event held in Pittsburgh and it was so much fun! I went to a spinning class, Zumba, and had a blast walking around downtown Pittsburgh all morning checking out vendors. This year, the event is expanding down to Lawrenceville with TONS of events (check out the schedule here) and two more dates added this summer! This also kicks off Pittsburgh's bike share program, which I can't wait to try out! Last year was a big year for Pittsburgh, because they also started offering free outdoor yoga classes in Market Square! I went to almost every class and fell in love with yoga. Practicing outside in such a beautiful area was so much fun, and I'm glad the classes are being offered again this year. There are lots of other options popping up as well if you can't get downtown- check out the list here! I'll be checking out the one on the Northside tomorrow morning! 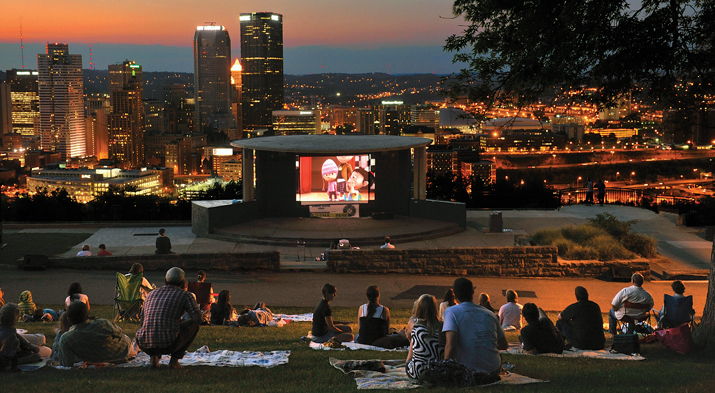 As long as I can remember, Pittsburgh has offered free outdoor movies in the summer at all of the city parks and some other popular areas. The movies are starting back up soon, and I'm hoping to go to a few! Check out the full list of venues and movies here (I'll definitely be checking out McFarland, USA and some of the mid-week concerts!). I've been obsessed with tennis for the past few years, and love watching the big 4 tournaments (Australian Open, French Open, Wimbledon and US Open). The French Open started this week and has been really exciting with lots of upsets and surprises. Are there any other tennis fans out there? What's your favorite tournament and player? So far, I'm really impressed with American Jack Sock, and would love to see a Sharapova/Serena (or Azarenka) final! I love listening to podcasts (I might even dedicate a post to my favorite podcasts because I listen to TONS) and this is my latest find! The show is basically two guys discussing each episode of Gilmore Girls (with lots of tangents) and it's hilarious! The two are very entertaining to listen to, and I love hearing a guy's perspective on the show. I watched the entire series once it came on Netflix last winter, and I'm thinking about re-watching and following along with the guys. Love it! I'm still in love with Kaitlin as the bachelorette and want to become her friend. She's SO funny and fit in perfectly with Amy Schumer on this week's episode. I liked the cliff-hanger at the end of the episode and I'm so glad that Kupah was asked to leave. I think we've all been in that situation when a guy doesn't want to hear that you're not interested in him (and just keeps saying "but you're hot..and pretty...". Loved Kaitlin's response of "there's more to me than just looks..." GO GIRL). unREAL looks great, especially if you're as into reality TV as I am. I understand that parts (ok, most of the shows) are fake and scripted- which is part of the fun for me-and this show completely exposes that. If you want to check out the first 9 minutes of the pilot, check it out here. Can't wait for it to premier on Monday! Cooking show + Reality competition = THE BEST. I absolutely love this show (and Top Chef!) and this season is off to a great start! I like the addition of Christina Tosi as a judge, but I miss Joe Bastianich. My early favorites are Derrick the drummer and Amanda!! My friend Steve (who I visited in Sweden recently) convinced me to start watching this show, and I wish I started soon. The show is similar to Scandal, but a lot more realistic (and everyone talks slower, thank goodness), so I think if you're a fan you would like this show as well. I've only watched two episodes so far, but I think I'm going to quickly become obsessed! I honestly never heard of this show until I saw it pop up on Hulu, but I'm obsessed! I watched the pilot and loved it. Six celebrities (Ciara, Nicole Scherzinger, Cheryl Burke, Joe Jonas, Alan Ritchson, and my new favorite comedian Jeff Dye) have to attempt to replicate a professional act in a week. The first show featured the Harlem Globetrotters, Penn and Teller, and aerial dancers. It was a lot of fun, and I really like the cast! Marlon Wayans is the host, and is SO funny! Nice, fun, run-of-the-mill club song. Good for running! I've been loving Ella Henderson lately, and this song is a great up-beat song. Even though it's over a year old, I'm just discovering it and love it! My classical piece for the week! This is one of my favorites, and I love how it's such a simple piece that builds intensity the whole time. So beautiful..Beethoven's the man! as well as Heather and Clare! They are! I love how all this free stuff is offered..my kind of price :) Yay for Bachelorette! Who are your favorites so far? The yoga in the square look like so much fun! You are gonna have a blast this summer. Hope you have a great weekend! Thanks Carissa! I'm definitely looking forward to this summer :) Hope your weekend is great as well! Oooh! Now I really want to check out "I can do that!" That sounds like something I would enjoy. And Gilmore Guys??? OMG. I can only imagine their opinions on that show!! And "Ghost" is a good song...I thought it was underrated and underplayed compared to the one that's so popular right now (Love me like you do). Oh well. That's probably why I didn't get sick of it! The guys are hilarious..definitely check it out! And I think you would love ICDT since we like similar shows :) Hope you have a great weekend! There's so much happening that I'm excited about! That BBQ sounds amazing..hope you have fun and everything goes well!! Looks like some fun summer events going on in Pittsburgh! I'm in Philly and I need to take advantage of these great activities - we just started up a bike share too and it's great! I'm visiting Philly at the end of the month..I'll have to hit you up for some suggestions! I'm so happy we finally got this program..i've seen it in other cities and have been patiently waiting for it to arrive :) Have a great weekend! I'm jealous of my parents in Boulder because CU has Shakespeare in the park during the summer. Wow, it sounds like there are a lot of really fun activities going on in Pittsburgh this summer! I ran the Pittsburgh Marathon a few years ago and really enjoyed exploring the city on foot (although, it was my first time there and I had no idea how hilly it was ;) ) Have a great weekend! Ohh that's definitely a rough course, especially if you aren't expecting the hills! Glad that you liked the city though :) Come back soon! Sounds like some awesome activities are going on this summer! I'm a little jealous! Yoga in the Square and Cinema in the Park sound like so much fun! I hope you have lots of time to enjoy everything this summer! I watch Master Chef too but I'm behind already. Have a great weekend! Thanks Alanna! There's still lots of time to get caught up..nothing too crazy has happened yet :) Enjoy your weekend as well! Pittsburg looks like a blast! It is!! Come visit sometime! Pittsburgh seems a lot like DC! I did yoga on the National Mall a few weekends ago, and yoga outside is the best! The only downside was that we were on a hill, so my section couldn't see the instructors on stage... Also the Mall's sprinkler system went off during sun salutations... ha! DC also has lawn movie showings! You'll have to let me know how McFarland is! I've been dying to see it. I've never gotten in to tennis myself, but my mom looooves it! Her bucket list includes going to all 4 biggies, and she's already crossed off the US Open and Wimbledon! I need to get into Podcasts. I've heard great things. Reality cooking shows ARE THE BEST. I'm all about some Chopped. Oh my gosh, I don't know what I would do if sprinklers just came on! That's so funny. I love DC and I can see how they're sinilar! I also love chopped..fun show :) thanks for stopping by and have a great weekend! I have a good friend that lives in Pittsburgh. Didn't know all those things going on this summer there. Will have to make a visit. Sounds like a fun city. I'm so glad it was on Netflix! I'm obsessed :) hope you're enjoying your weekend! A couple of years ago I visited Pittsburgh and enjoyed running over the yellow bridges. Beethoven - Allegretto from Symphony No. 7 - one of my favorites! Top Five Friday #10 : Happy 100!